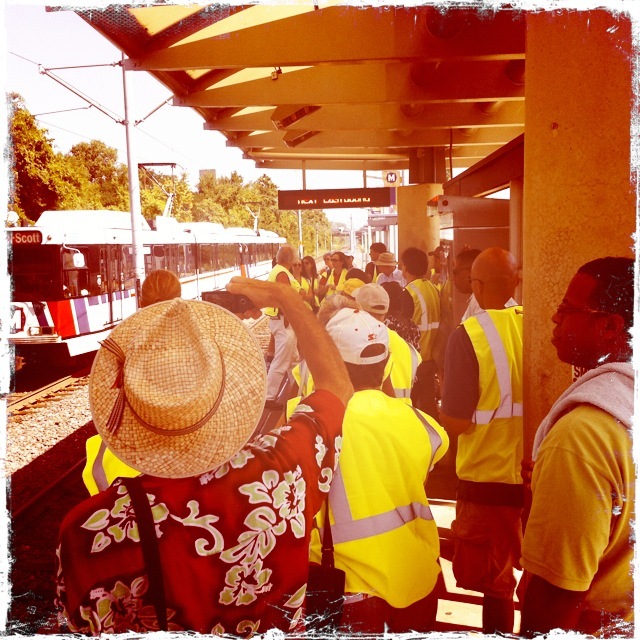 Today, a group of dedicated walking, transit and community advocates braved the heat to join Dan Burden, an international expert in walkability and neighborhood development, on “walking audits” of the Wellston and Delmar MetroLink Stations. The audits, along with presentations and group discussions, sought to capture the imagination and interest of the community in the possibilities around MetroLink stations. The events, part of Walk/Live St. Louis 2012, were brought to you through a collaboration between Housing & Community Solutions, Inc., the St. Louis Association of Realtors, Trailnet, the Livable St. Louis Network, and Great Rivers Greenway. How does an area become a community where people want to walk, live and play? How does a community become a place in which businesses want to invest? How do we make use of our transit investments to connect community and businesses? As Burden told the group at the Metropolitan Education and Training (MET) Center during the Wellston gathering, a key component of successful walkable developments is getting the community involved from the start. Engage citizens to imagine what is possible for their own neighborhoods, and inspire ownership and participation. Events like this are one example of a growing interest in transit-oriented development, walkable neighborhoods, and livable communities created by intentional development and community engagement. Citizens for Modern Transit hosts a clearinghouse of TOD information, as well as events and educational sessions to promote community investment. The St. Louis Regional Plan for Sustainable Development is creating collection of recommended model ordinances, strategies, and plans that may be used by local governments and citizens to further the goals for fostering economically competitive, opportunity-rich communities. Metro will soon publish profiles of every MetroLink station to help developers and communities understand the potential at and around our region’s transit investments. Drive down any major highway in the United States and you will see highway-oriented development just off the exit ramps. It is so common now to the American experience that we forget that at one time, these developments involved risk and committed leadership. Efforts like the Walk/Live St. Louis 2012 are here to remind us how to imagine what possibilities and frontiers still exist.